American Tourister: 30-70% of American Tourister backpacks, under seat carry-on & huge variety of other bags. Sale ends October 15, 2018. Veken Neck Travel Pillow: Regularly $24.99, just $10 with coupon code 60JFG8TF. Offer ends October 15, 2018. Samsonite: Weekly Steal! Great deals on select Samsonite bags! Offer ends October 16, 2018. Disneyland: Save up to 15% off 2-day 1-park or 2-day park hopper tickets. Each ticket includes $25 Restaurant.com card. Offer ends October 16, 2018. On The Border: Buy any entree and get another entree for 50% off. Offer ends October 18, 2018. Wild Florida – From Monday, October 15 through Saturday, October 20 (their first ever Sloth Week), all guests will enjoy free admission to their Gator & Wifelife Park. Offer ends October 20, 2018. Wonderful Life Family Passport Wallet: Regularly $16,99, just $9.34 with code IQH3ACLIN. Offer ends October 20, 2018. Samsonite 5-Piece Nested Luggage: Regularly $250, just $99 with coupon code FIELDTRIP. Offer ends October 21, 2018. Maggianos: Get a lasagna dinner for four for $50 in a new carryout special. Offer ends October 21, 2018. 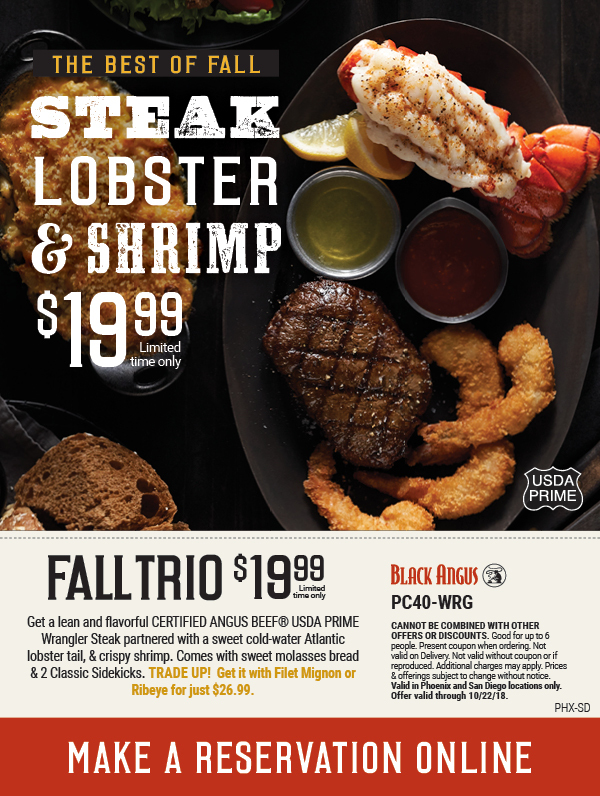 Black Angus: Get a Surf ‘n Turf dinner for $19.99 with this Black Angus coupon (coupon in link) good through October 22, 2018. SeaWorld Orlando: 1-day ticket for $75. Regularly $100 – save 25%. Offer ends October 27, 2018 or when sold out, whichever occurs first. SeaWorld (Orlando): Enjoy one free child admission (ages 3-9) with each full paid adult admission to SeaWorld Orlando. Offer valid on SeaWorld’s Halloween Spooktacular weekends dates only September 22-23, September 29-30, October 6-7, October 13-14, October 20-21 and October 27-28. Offer ends October 28, 2018. Offer expires October 28, 2018. 2-Pack Lermende Clear Toiletry Bags: Usually $11.99, just $5.40 with coupon code XY2J5RZM. Offer ends October 30, 2018. Caribou Coffee: Buy a Fall Tumber and get free coffee refills through October 31, 2018. Offer ends October 31, 2018. Macaroni Grill: A FREE Mom’s Ricotta Meatballs and Spaghetti for all fire fighters, police officers, paramedics and hospital medical staff. Offer ends October 31, 2018. Reebok: Save $10 off your purchase of $50 or more at any U.S. Reebok Outlet Store, with coupon (coupon in link). Offer ends October 31, 2018..
Del Taco: Buy one, get one free (1/2 lb. Bean & Cheese burritos) Offer end October 31, 2018. Hash House A Go Go (Orlando): Get a $50 gift certificate for $29 (42% off). Offer ends October 31, 2018 or when sold out, whichever occurs first. Ripley’s Believe It Or Not (I-Drive, Orlando): Save $2 off adult/$1 off child, up to 6 people. Offer ends October 31, 2018. Panda Express: Enter promo code HONEYISBACK during checkout at Panda Express Online or in the Panda Express app to get $3 off a purchase of $5 or more. Offer ends October 31, 2018. McDonald’s: “Free Happy Meal with the purchase of any extra value mean. Offer ends October 31, 2018. Pirate’s Cove Adventure Golf (I-Drive, Orlando): Save $1 per person, up to 6 people. Offer ends October 31, 2018. Halloween Horror Nights (Universal Orlando): Save 39% off gate price. Flex Sunday-Thur ticket regularly $14.99, just $69.99. Ticket is valid for 1 person for any one night of valid dates: September 16, 19, 20, 23, 26, and 30, October 3, 4, 7, 10, 11, 14, 17, 18, 21, 24, 25, 28, and 31, and November 1. Offer ends November 1, 2018. The Ritz-Carlton (Colorado Springs): Save up to 31% off spa services, including massage, facial, and manicure. Offer ends November 1, 2018. 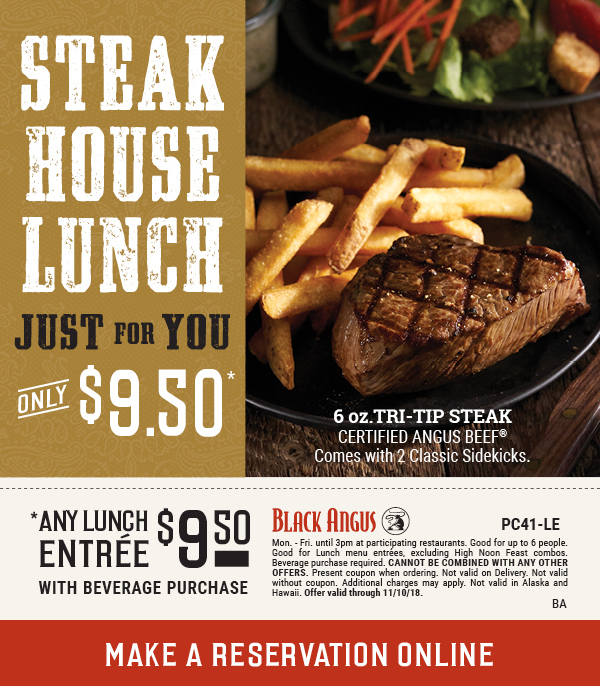 Black Angus: Get any lunch entree for $9.50 with this Black Angus coupon (coupon in link) good through November 10, 2018. NASCAR Indoor Cart Racing (Orlando): Save up to 34% off. Offer ends December 11, 2018. Saturday Night Live Exhibit (Chicago): Save 25% off tickets at the Museum of Broadcast Communications. Offer ends December 20, 2018. ATV Off-Road Guided Adventure: Save 23% off tickets for one, two or four people. Offer expires December 28, 2018. Aquarium of The Bay (San Francisco): Save 28% off one-day generation admission ticket. Offer ends December 30, 2018. Capone’s Dinner and Show (Orlando): 1/2 off all tickets for all Florida residents OR AAA Members OR AARP Members with ID. Offer ends December 31, 2018. One World Observatory (NYC): Save 20% off standard reserved admission tickets when ordering online and using the code JBFALL. Offer ends December 31, 2018. ICE! At Gaylord Palms: Various savings available, including 40% off tickets (this may be the best deal of the season for this event). Offer ends January 6, 2019. Madame Tussauds (Orlando): Save up to 25% off admission. Offer ends January 31, 2019. Sea Life Orlando: Save up to 20% off. Offer ends January 31, 2019. I-Drive Combo (Orlando): 14-Day Trolley Pass, General Entry to Madame Tussauds, General Entry to SeaLife Aquarium, One Ride on the ICON Eye for $45. Offer is ongoing. WOW! Pack (Orlando): 14-Day Trolley Pass, General Entry to WonderWorks, Round of Crazy Golf at Gator Golf, General Entry to Madame Tussauds, General Entry to SeaLife Aquarium, One Ride on the ICON Eye for $79A/$69C. Offer is ongoing. Pirate Pack (Orlando): Dinner & a Show at Pirate’s Dinner Adventure, General Entry to Skeletons, General Entry to Chocolate Kingdom, Round of Crazy Golf at Gator Golf for $79A/$69C. Offer is ongoing.